Launched into a solar orbit on Aug. 25, 2003, Spitzer trails behind Earth and has been gradually drifting farther away from our planet. Spitzer was the final of NASA's four Great Observatories to reach space. Initially scheduled for a minimum 2.5-year primary mission, NASA's Spitzer Space Telescope has lasted far beyond its expected lifetime. Spitzer detects infrared light, which is often emitted by warm objects such as heat radiation. 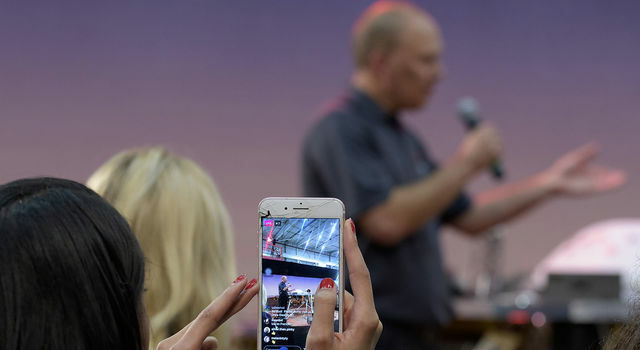 While Spitzer mission designers never planned to use the observatory to study planets beyond our solar system, its infrared vision has proven to be an invaluable tool in this field. In May 2009, scientists using data from Spitzer produced the first-ever "weather map" of an exoplanet -- a planet that orbits a star other than the Sun. This exoplanet weather map charted temperature variations over the surface of a giant gas planet, HD 189733b. In addition, the study revealed that roaring winds likely whip through the planet's atmosphere. The image above shows an artist's impression of the planet. Infrared light can, in most cases, penetrate gas and dust clouds better than visible light. 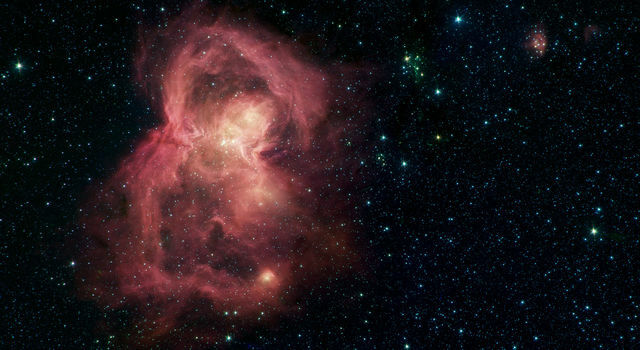 As a result, Spitzer has provided unprecedented views into regions where stars are born. This image from Spitzer shows newborn stars peeking out from beneath their natal blanket of dust in the Rho Ophiuchi dark cloud. Called "Rho Oph" by astronomers, this cloud is one of the closest star-forming regions to our own Solar System. Located near the constellations Scorpius and Ophiuchus on the sky, the nebula is about 410 light years away from Earth. In 2011, astronomers using Spitzer detected a very distant collection of galaxies called COSMOS-AzTEC3. The light from this group of galaxies had traveled for more than 12 billion years to reach Earth. Astronomers think objects like this one, called a proto-cluster, eventually grew into modern galaxy clusters, or groups of galaxies bound together by gravity. COSMOS-AzTEC3 was the most distant proto-cluster ever detected at the time.It provides researchers with a better idea of how galaxies have formed and evolved throughout the history of the universe. When NASA's Deep Impact spacecraft intentionally smashed into comet Tempel 1 on July 4, 2005, it expelled a cloud of material that contained the ingredients of our solar system's primordial "soup." Combining data from Deep Impact with observations by Spitzer, astronomers analyzed that soup and began to identify the ingredients that eventually produced planets, comets and other bodies in our solar system. Many of the components identified in the comet dust were known comet ingredients, such as silicates, or sand. But there were also surprise ingredients, such as clay, carbonates (found in seashells), iron-bearing compounds, and aromatic hydrocarbons that are found in barbecue pits and automobile exhaust on Earth. The study of these ingredients provides valuable clues about the formation of our solar system. Saturn's stunning ring system has been photographed extensively, but those portraits have not revealed the planet's largest ring. The wispy structure is a diffuse collection of particles that orbits Saturn much farther from the planet than any of the other known rings. The ring starts about six million kilometers (3.7 million miles) away from the planet. It is about 170 times wider than the diameter of Saturn, and about 20 times thicker than the diameter of the planet. If we could see the ring with our eyes, it would be twice the size of the full Moon in the sky. One of Saturn's farthest moons, Phoebe, circles within the ring and is likely the source of its material. The relatively small numbers of particles in the ring don't reflect much visible light, especially out at Saturn's orbit where sunlight is weak, which is why it remained hidden for so long. Spitzer was able to detect the glow of cool dust in the ring, which has a temperature of about minus 316 degrees Fahrenheit or minus 193 degrees Celsius, which is 80 Kelvin. Buckyballs are spherical carbon molecules that have the hexagon-pentagon pattern seen on the surface of a soccer ball. However, buckyballs are named for their resemblance to geodesic domes designed by architect Buckminster Fuller. These spherical molecules belong to a class of molecules known as buckminsterfullerenes, or fullerenes, which have applications in medicine, engineering and energy storage. Spitzer was the first telescope to identify Buckyballs in space. It discovered the spheres in the material around a dying star, or planetary nebula, called Tc 1. The star at the center of Tc 1 was once similar to our Sun, but as it aged, it sloughed off its outer layers, leaving only a dense white-dwarf star. Astronomers believe buckyballs were created in layers of carbon that were blown off the star. Follow-up studies using Spitzer data have helped scientists learn more about the prevalence of these unique carbon structures in nature. Spitzer has found evidence of several rocky collisions in distant solar systems. These types of collisions were common in the early days of our own Solar System, and played a role in the formation of planets. In one particular series of observations, Spitzer identified an eruption of dust around a young star that could be the result of a smashup between two large asteroids. Scientists had already been observing the system when the eruption occurred, marking the first time scientists had collected data about a system both before and after one of these dusty eruptions. 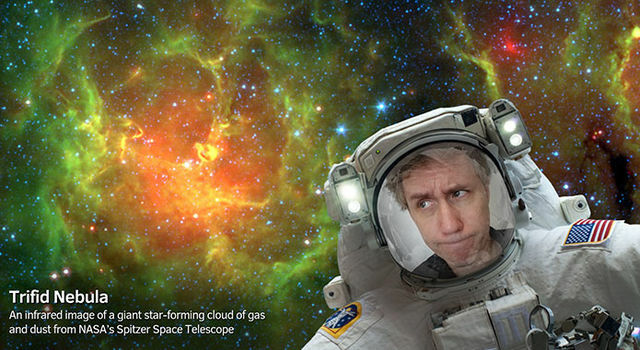 In 2007, Spitzer became the first telescope to directly identify molecules in the atmospheres of exoplanets. Scientists used a technique called spectroscopy to identify chemical molecules in two different gas exoplanets. Called HD 209458b and HD 189733b, these so-called "hot Jupiters" are made of gas (rather than rock), but orbit much closer to their suns than the gas planets in our own solar system. The direct study of the composition of exoplanet atmospheres was a significant step toward the possibility of one day detecting signs of life on rocky exoplanets. The artist's concept above shows what one of these hot Jupiters might look like. Supermassive black holes lurk at the cores of most galaxies. 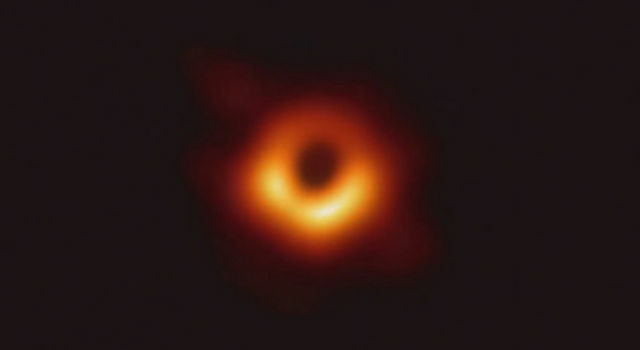 Scientists using Spitzer identified two of the most distant supermassive black holes ever discovered, providing a glimpse into the history of galaxy formation in the universe. Galactic black holes are usually surrounded by structures of dust and gas that feed and sustain them. These black holes and the disks that surround them are called quasars. The light from the two quasars detected by Spitzer traveled for 13 billion years to reach Earth, which means they formed less than 1 billion years after the birth of the universe. In 2010, Spitzer helped scientists detect one of the most remote planets ever discovered, located about 13,000 light-years away from Earth.Most previously known exoplanets lie within about 1,000 light years of Earth. The figure above shows these relative distances. Spitzer accomplished this task with the help of a ground-based telescope and a planet-hunting technique called microlensing. This approach relies on a phenomenon called gravitational lensing, in which light is bent and magnified by gravity. When a star passes in front of a more distant star, as seen from Earth, the foreground star's gravity can bend and magnify the light from the background star. If a planet orbits the foreground star, the planet's gravity can contribute to the magnification and leave a distinctive imprint on the magnified light. The discovery provides one more clue for scientists who want to know if the population of planets is similar throughout different regions of the galaxy, or if it differs from what has been observed in our local neighborhood. Spitzer was the first telescope to directly observe light from a planet outside our solar system. Prior to that, exoplanets had been observed only indirectly. This accomplishment kicked off a new era in exoplanet science, and marked a major milestone on the journey toward detecting possible signs of life on rocky exoplanets. 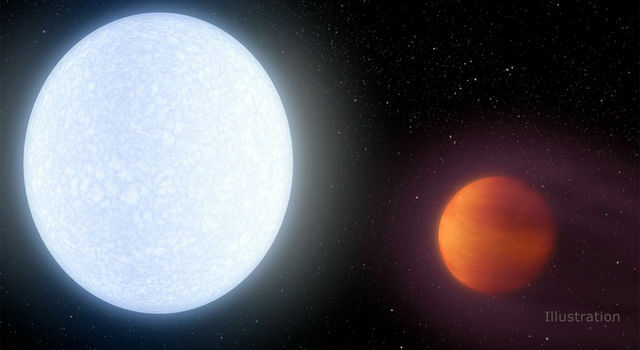 Two studies released in 2005 reported direct observations of the warm infrared glows from two previously detected "hot Jupiter" planets, designated HD 209458b and TrES-r1. Hot Jupiters are gas giants similar to Jupiter or Saturn, but are positioned extremely close to their parent stars. From their toasty orbits, they soak up ample starlight and shine brightly in infrared wavelengths. Spitzer's infrared vision allows it to study some of the most distant objects ever discovered. But this space observatory can also be used to study small objects closer to Earth. In particular, Spitzer has helped scientists identify and study Near-Earth Asteroids (NEAs). NASA monitors these objects to make sure none of them are on a collision course with our planet. Spitzer is particularly useful for characterizing the true sizes of NEAs, because it detects infrared light radiated directly from the asteroids. By comparison, asteroids do not radiate visible light, but merely reflect it from the Sun; as a result, visible light may reveal how reflective the asteroid is, but not necessarily how large it is. Spitzer has been used to study many NEAs that are less than 110 yards (100 meters) wide. In 2013, scientists compiled more than 2 million Spitzer images collected over 10 years to create one of the most extensive maps of the Milky Way galaxy ever made. The map data came primarily from the Galactic Legacy Mid-Plane Survey Extraordinaire 360 project (GLIMPSE360). Viewing the Milky Way is a challenge because dust blocks visible light, such that entire regions of the galaxy are hidden from view. But infrared light can often penetrate dusty regions better than visible light, and reveal hidden sections of the galaxy. Studies of the Milky Way galaxy using Spitzer data have provided scientists with better maps of the galaxy's spiral structure and its central "bar" of stars. Spitzer has helped discover new remote sites of star formation, and has revealed a higher abundance of carbon in the galaxy than expected. The GLIMPSE360 map continues to guide astronomers in their exploration of our home galaxy. Spitzer has made major contributions to the study of some of the earliest-forming galaxies ever studied. The light from these galaxies takes billions of years to reach Earth, and thus scientists see them as they were billions of years ago. The most distant galaxies observed by Spitzer radiated their light about 13.4 billion years ago, or less than 400 million years after the birth of the universe. One of the most surprising discoveries in this area of research was the detection of "big baby" galaxies, or those that were much larger and more mature than scientists thought early-forming galaxies could be. Scientists believe large, modern galaxies formed through the gradual merger of smaller galaxies. But the "big baby" galaxies showed that massive collections of stars came together very early in the history of the universe. Seven Earth-size planets orbit the star known as TRAPPIST-1. The largest batch of Earth-size planets ever discovered in a single system, this amazing planetary system has inspired scientists and non-scientists alike. Three of the planets sit in the "habitable zone" around the star, where temperatures might be right to support liquid water on a planet's surface. The discovery represents a major step in the search for life beyond our Solar System. Scientists observed the TRAPPIST-1 system for over 500 hours with Spitzer to determine how many planets are orbiting the star. The telescope's infrared vision was ideal for studying the TRAPPIST-1 star, which is much cooler than our Sun. The scientists observed the faint dips in the star's light as the seven planets passed in front. Spitzer's observations have also allowed scientists to learn about the size and mass of these planets, which can be used to narrow down what the planets might be composed of.